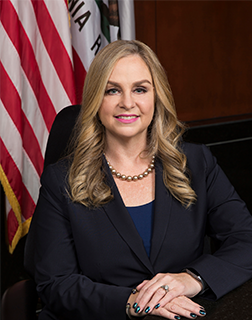 Councilmember Melissa Fox is an Orange County native, business owner, attorney, wife, and mother. She was elected in November 2016 to a four-year term on the Irvine City Council. Prior to her election to the City Council, Melissa served for four years on the Irvine Community Services Commission, where she fought to ensure ample open space, park and recreation facilities for both children and adults, for increased childcare, to improve and expand the Gratitude and Honor Memorial remembering the fallen heroes of the War on Terrorism, and to ensure that our seniors have state-of-the-art recreation and healthcare facilities. Throughout her career, Melissa has built bridges to bring together people with different perspectives to take on tough challenges. She has championed creating more active and public transportation choices in Irvine as a means of reducing traffic congestion, and has also been Irvine’s most public advocate for more and safer bicycling, for both recreation and commuting. Melissa is a member of the Bars of the State of California and the United States Tax Court, and a graduate of Brandeis University and Tulane University School of Law. She is the founder of the Fox Law Firm in Irvine and has practiced law in Orange County for more than 20 years, advising large and small businesses, as well as organizations and individuals. She has also earned a California real estate broker’s license. Melissa participates in many professional and community organizations. Melissa has been a member of the Irvine Chamber of Commerce, the Board of Directors of the Beckman High School Football Boosters and Beckman High School Wrestling Boosters, and serves as an adult volunteer with the Sea Scouts (a co-ed program of the Boy Scouts of America) at the Dana Point Sea Base. Melissa also served in the Orange County Parks Ranger Reserve. Melissa also serves on multiple local and regional agencies, including the Orange County Fire Authority, Community Energy Partnership, Library Advisory Board of Orange County Library System, the Laguna Canyon Foundation, Newport Bay Watershed Executive Committee, One water one Watershed Steering Committee, the San Joaquin Marsh Wildlife Sanctuary, Santa Ana River Flood Protection Agency Commission, the Green Ribbon Environmental Committee, and the Irvine Community Land Trust. Melissa is a past president of the California National Women’s Political Caucus, and is a strong advocate for increasing the participation of women in government and civic affairs. Melissa lives with her husband, Dr. Michael Fox, and their teenage son, Max, in the Portola Springs community of Irvine. All correspondence is public record.